We provide professional reliable, and high performance heating services in Suffolk, Essex and beyond. At Smart Heating Solutions, we’re a one-stop-shop for heating and boiler services. Experts in all areas of Gas, Oil and Renewables heating for both commercial and domestic properties. We offer a range of services including boiler replacement, installation and repairs, commercial heating and boiler services and renewables. Over the years we’ve established a customer focused service that works around you – and we have to admit that we’re pretty proud of it! This means that we can promise super-quick response times and we won’t ever charge you a call out fee. We firmly believe in transparency and we’re always upfront with our prices – that’s a promise! Of course, we could spend all day telling you how great we are, but we wouldn’t expect you to simply take our word for it. 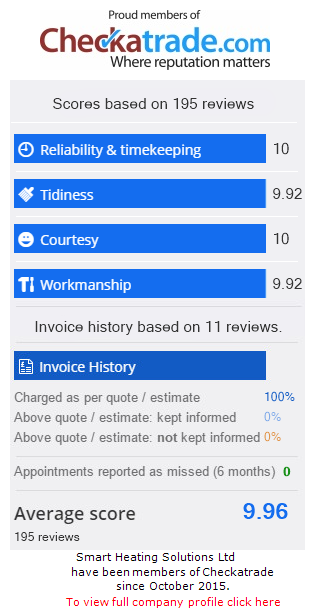 So why not check out our Check-a-trade references and reviews to see what our customers have said about our services?